Happy Friday and welcome to Day 19! Keep loading them into the 25 Days of Christmas Tags Flickr Group, they look fantastic. Today I have the team from Tag You're It as my guests! 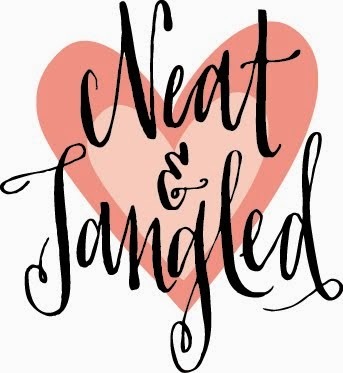 Please pay a visit to Tag You're It to see how some of today's tags were inspired and to play along as it coincides with the new Challenge #11! For a chance to win one of the prizes leave me a comment telling me if you put a wreath up on your front door? Thank you to the team at Tag You're It for joining me as my guests today! Marvellous tags. These posts are so much fun to read. I'm loving all the inspiration. Such a talented team of designers! Each tag is sheer delight! That's a good question about the wreath. I always did but just got a new front door so I'm not sure one will fit. Gorgeous tags once again, ladies! We do put a wreath on our door :) I love love love today's tags! They are just gorgeous!!!!!! Beautiful tags! It's looking more and more like Christmas all the time :) No, I don't put a wreath on my front door. Wonderful tags today! As for wreath on the front door - definitely love it - such a festive touch! Ooh - so pretty! Yes, I do put a wreath up each year. I feel that it truly welcomes guests. What a great collection of tags today. All so different. I do put a pinecone wreath that I made about 40 years ago . It is still in great condition too. I've only had to change the ribbon a few times. I'm not sure what I'll put on the front door. It probably won't be a wreath but it will have flowers and ribbons. the tag is so pretty. 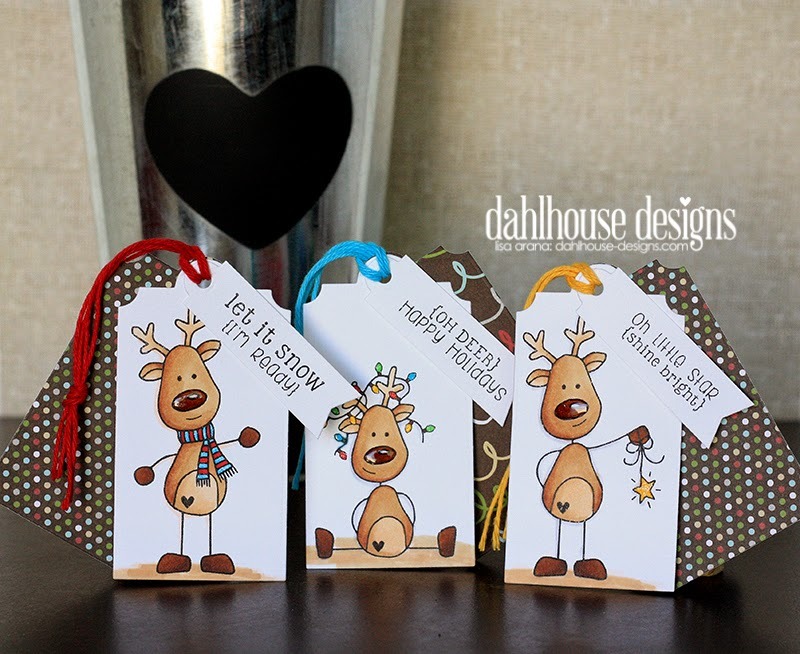 Hadn't thought about doubling the tag but I'm going to make some like that this year. Beautiful tags!! No wreath on our front door. I don't put a wreath up, but have an adorable life-sized snow-dude made of felt that stands on the front porch!! Oh my goodness from cute to elegant these are all fabulous! What a great hop line up!! Yes, I do try to put a wreath on my front door and office door every year! :) Thank you as always for the chance to win great products! Oh my goodness what great tags! So cute and creative! Thanks for the inspiration. And YES, I have a wreath on my front door. I think the front door is a great way to decorate every season to welcome your guests into your home. I do put up a Christmas wreath on my front door. I try to keep a seasonal decoration on my front door year round. Unfortunately, this year, my Valentine's Day banner and my Spring wreath both disappeared. :-( The good news is that so far my Fall decoration is still there. all of these are sooo dang cute!!!! YES we always have a wreath on our door. Oh yeah, I'm all about the wreath. I LOVE all of them and your creativity is inspiring! Nope, no wreath on my front door! 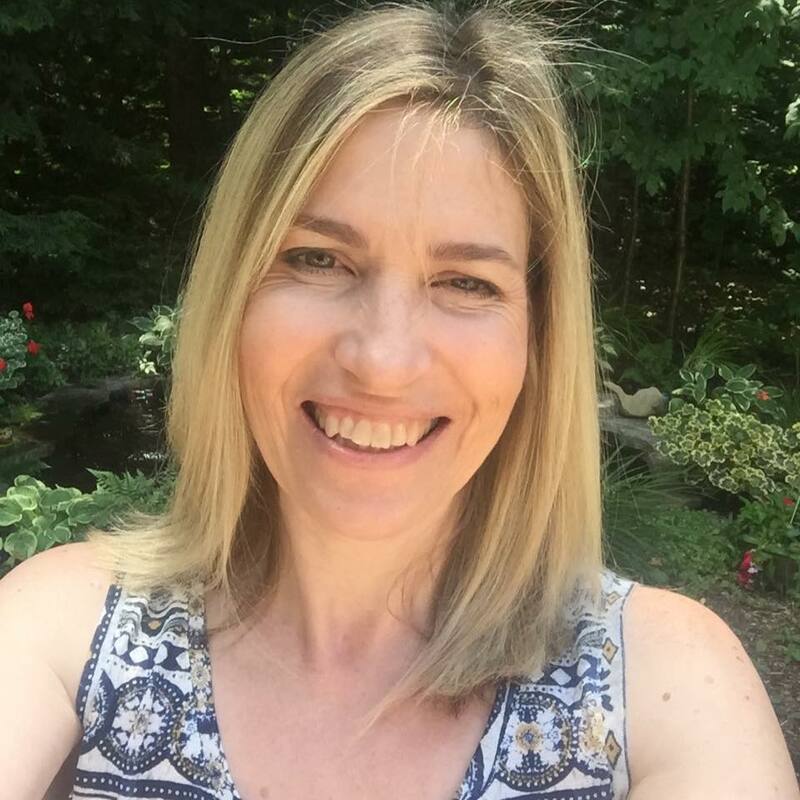 Thanks for asking us to play along with your challenge, Tracey! I love your sweet tag! Another amazing day of lovely inspiration! I am feeling all inspired to create tags!!! Fun stuff and yes, I do put a wreath on my door. I have one up most of the year but it is fun to have a special one for the Holidays. your tag is nice! no we don't put a wreath on our door. 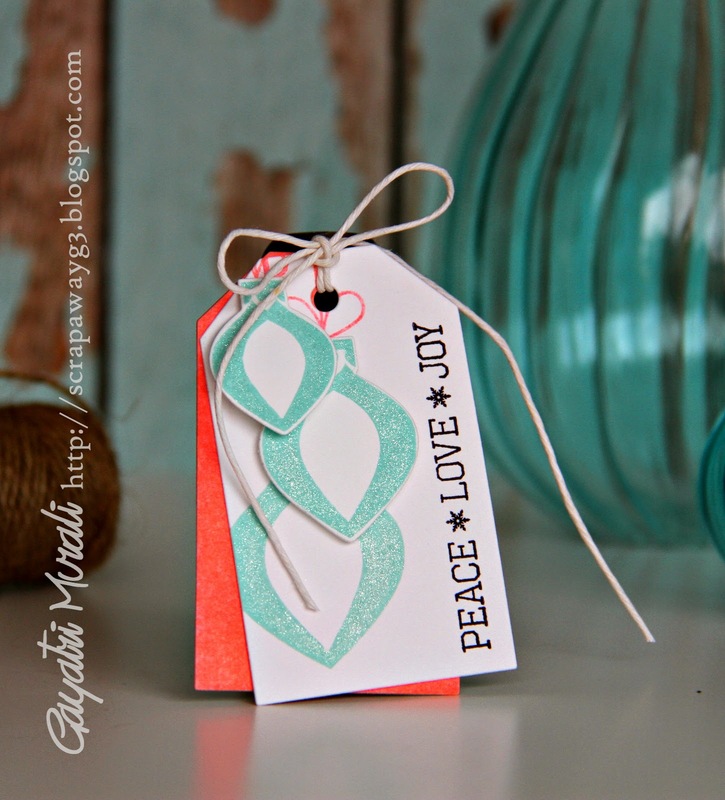 Love this wreath tag! I haven't been putting up a wreath the past few years, but I think I'm going to put one up this year. 3 wreaths at our doorway.... Ancient and in need of replacement! Fabulous tags...and it's great to see some of them incorporated onto cards. Yes, I always have a wreath on my front door. I really like your use of layers and the wreath is so pretty. Awesome tags! 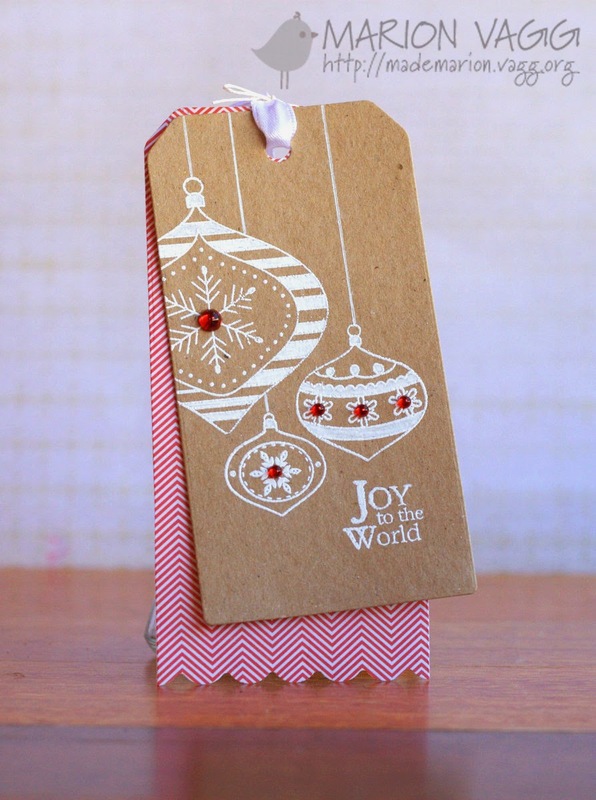 Love your cute wreath tag! Funny story about a front door wreath... hung an artificial greenery wreath on my front door last year. It is just plain, no ribbons or ornaments. After the holidays, I packed away all of my Christmas decorations and put the boxes up in the attic... (packed everything, or so I thought). The wreath was still on the door and we have left it there all year long! Sometimes we put a wreath on our chimney instead of our front door. Fabulous tags ladies! Yes, I hang two wreaths - one on the front door and one on the side door! They look so pretty with a light dusting of snow! Beautiful tags and yes, a wreath with a red bow is always on my front door for the holidays. Love Your tags and yes I put a wreath on my door. I don't put a wreath up at Christmas, but I'm in the market for one. Beautiful tags!! Yes I put a wreath on my front door. It was so fun to see the cards and tags from the TYIC team...thanks! 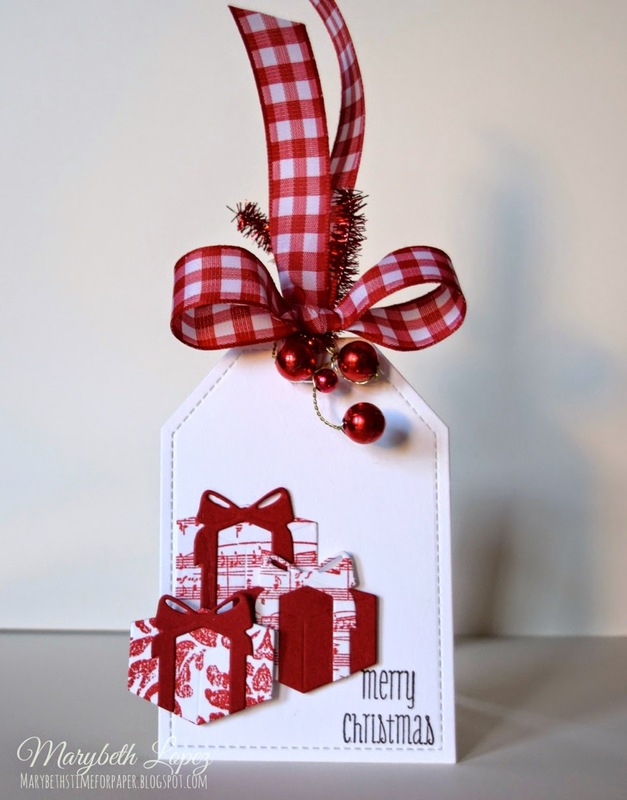 I love your wreath, and how you placed the red and white pattern on the 2nd tag...so beautiful! This is just so fun! I adore those little reindeer tags, and the unique, holiday palette of Gayatri's is delish! Love the two-panel design of yours, too, girl! And we always put a wreath up on our front door ;). Have a great weekend! SO MANY tags to LOVE today - THANK YOU EVERYONE!!! Oh my, such FUN tags ladies! Love your double tag Tracey...perfect papers and colors. Yep, there will be a wreath. Fabulous tags. Our door opens to the side when you come up the steps, so I have a 60" grape vine wreath on the wall at the top of the steps that I decorate for each of the seasons. 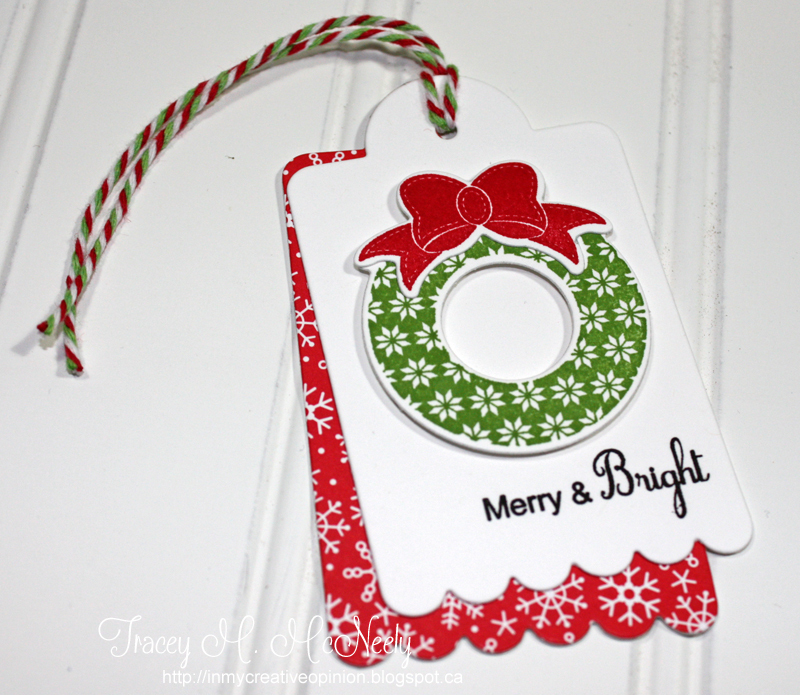 Love the wreath tags and all of today's tags! Love your festive tag! I put a wreath on my door but on the INSIDE because I don't have a storm door to protect it from the elements. I also hang a wreath on the powder room door. Love all these tags! Great variety and inspiration! Always a wreath, for every season! In love with all the posts today. Nope--no wreaths at my house. Sorry 'bout that. Wonderful tag, Tracey! Love the bright red snowflake tag layered underneath and your wreath is very pretty. 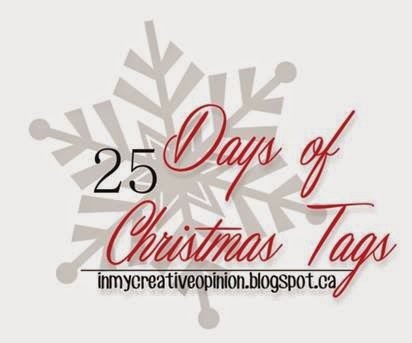 Thanks for inviting our team to play along with your 25 Days of Christmas Tags. I do not decorate for any holiday really. But I love seeing them on everyone else's door. I have NEVER seen so many BEAUTIFUL tags in ONE PLACE!! Gorgeous work, ladies! Awesome! Love those cute little reindeer!! Great tags today from the Tag your it gals! Those reindeer are so cute! And I like your tag with the double layer! Yes I put a wreath on my front door for the holiday! I love wreaths and have one up year round. Right now it is fall themed but Friday my Christmas wreath will go up. Another day of awesome tags. One is more beautiful than the next. I do put up a wreath, but on my porch wall instead of the door. Very pretty tags. I love your wreath and yes I always have a wreath on my front door for the festive season. I always have a different for wreath each Christmas. And is always one I've mage. This year's is plastic ornaments strung on wire & formed into a circle. I added some lights & it was done. Thanks for the great tag inspiration! More stunning inspiration, which I'll be heading off to see 'up close and personal' right away. Your tag features one of my favourite CB sets...love your wreath and the festive red/green combo! Oops...forgot to answer your question: yes, wreath on my door! Love them all! YES I sure do put a wreath on my front door! That reindeer is adorable!!!! LOVE him! I love these tags!! I put a wreath on the front door and sometimes on the garage door too! No one ever uses my front door... so I put a wreath on my door to the garage instead. What incredible tags! Everyday they are just outstanding! Not enough adjectives to describe these tags! I put a wreath beside the front door on the house! I put a wreath on the other side of the door, though. Excellent tags--so perfect! I love them! WOWZER, these tags today are right up my alley (so many are my style). Our wreath doesn't hang on our front door but right beside it. Loving all the tag the DT made here! 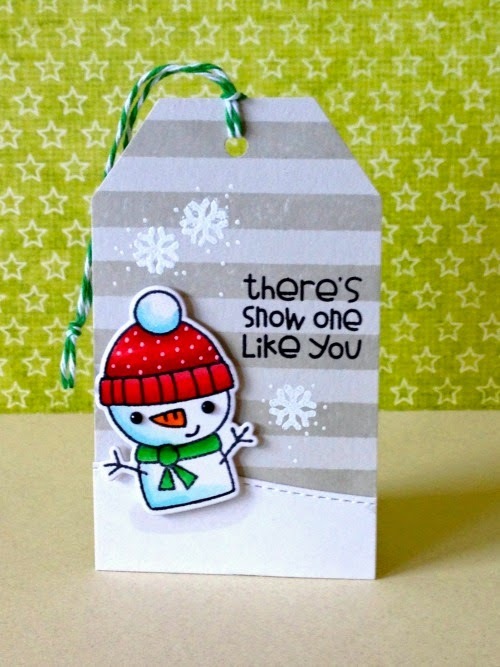 Your wreath tag is adorable! OK, you've made me want to pull out that CBS wreath - first set I ever got from them cuz I thought it was so cool. Love the double tag. Such a great collection of tags. I put a twiggy wreath on our door! Great tag! I love this CAS design and the wonderful patterns and traditional colors! We do put a wreath on our front door. It's one I made many years ago that I should probably update/re-do. I love the papers on this tag! Love the scallop too. We do put a wreath on our front door! There's a company in Nova Scotia that makes wreaths with fresh evergreens and we order one each year. They even include an indoor/outdoor bow and picks with cheery faux crabaples and berries to decorate your wreath. What a great collection of tags. I really like the tag from Lynn Putt today. There haven't been that many tags with little houses on them, a few I guess. But I love the white on white look of this one and the pop of bright colors on the house. Super cute!